Mail Sorter: What is it, Mail Runner? 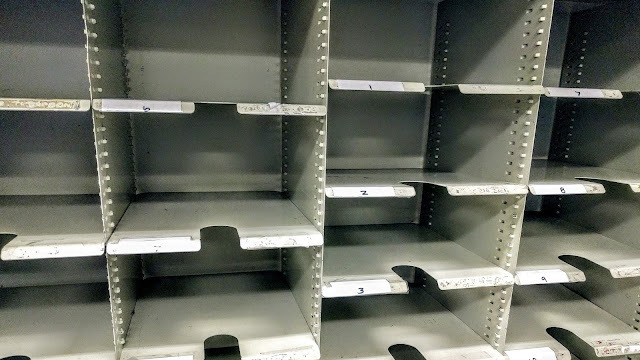 Mail Sorter: I can tell you’re thinking about something. That’s the second time you’ve compulsively pushed the cubbies against the back wall. You push ‘em back any further and they’ll end up in the next room. Mail Runner: Oh, I’m just anxious. I’ve spent every day since getting this job running mail up to the floors endlessly. Now that I don’t have anything to do, my resolve is stronger than ever. Mail Sorter: What resolve might that be? Mail Runner: I think we should quit? Mail Sorter: Both of us? At the same time? Mail Runner: Yes, exactly at the same time. We should walk out of here right now and never come back. Mail Sorter: That would cause problems. Mail Runner: For who? For us? No, we’ll be gone, and frankly, I don’t care about these people...or what they think of me. Mail Sorter: You should. Every choice you make leads to consequences, good or bad. You can’t just walk out of your job. You have to give then two weeks notice. Mail Runner: Mail Sorter, this is a terrible job. They don’t deserve two weeks notice. They don’t deserve two seconds notice! Mail Sorter: I’m not talking about what’s good for the company. This can have an effect on your future. It is common practice to provide your current employer with two weeks notice. If you applied for a new job, and were given an offer, it would be perfectly appropriate to inform them that you would not be able to begin work once you accept the position. They build that time into their search projections. And this is important to understand, because you have to know that all legitimate businesses behave this way, and if you subvert these manners, you will only make yourself look bad. Mail Runner: I heard that employers only call previous employers to confirm dates of employment and list of responsibilities. Mail Sorter: That may be, but bear in mind that we’re dealing with humans. They say what they want. You piss off your employer enough, they could make things tough. You remember Mick Daniel? He quit without giving notice. He just left his badge on the table and never returned. I’ve kept track of him on social media. He’s been out of work ever since. Mail Runner: I didn’t know that. Mailer Sorter: This may be the worst place to work ever, but potential employers don’t want to hear that about your last job. No matter how true it is, that will only cause them to think that you’re not loyal, or a team player. You have to finesse your way into a job by simultaneously making it look like you like your old job, but also that you’re ready for something better. It’s a tricky dance. I can teach you. Let’s do this thing right. Mail Runner: So you’re in?